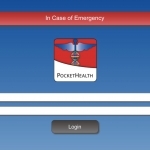 PocketHealth is a patient app developed by Cognovant as a mobile Personal Health Record (mPHR) available for the iPhone, iPad and Android platforms. This is an ambitious and comprehensive app based on Electronic Health Record features for individual use. It’s stated purpose by the developer is to allow consumers to take control of their health data and care for their own personal use and to share with their providers. It is encrypted and stored solely on the device.